On any given day, managers face employee relations issues. While these issues may differ in seriousness, one thing they have in common is that they require the ability to effectively communicate with the employees involved. Yet, many managers lack the knowledge and training to handle the variety of conversations that can arise from these issues. Written by Associate Editor Kyra L. Kudick, the free whitepaper covers the five most common mistakes managers make that could potentially lead good workers right out the door and how to prevent that from happening. 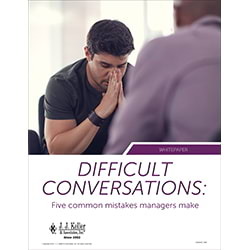 Fill out the form to download your FREE whitepaper - Difficult Conversations: Five Common Mistakes Managers Are Making.